Feel free to offer any questions, suggestions, and other comments! Apprehension is what I feel after a week of learning about being an interviewer. It puts a lot of pressure on you, especially for a project like this. As much as Joe and I are doing this project is for Kirksville, it is our project. Until the future, it’s unclear what benefit this project will have on us, on Kirksville, and on the people we interview. At the moment, it’s us who determine that. It’s us who ask the questions that encourage a story. That don’t push too far, yet don’t leave too many details out. So, this is step one: the questions. At this moment, I feel we have way too many questions, but we can narrow it down based on who we’re interviewing and what answers we get from other people. For example, if interviewers keep giving us the same answers, we can switch the questions. Nevertheless, here is what we want to know. Note: Some of the questions may seem general, but they have been simplified since most of the interviewees will be English Language Learners. Christa and I have decided that we will be interviewing Somalian refugees in Lewiston, Maine. We have chosen this group of migrants for a few reasons. One reason being the great impact they have had on the Maine economy, and another being the new front of diversity they ushered into our secluded state. 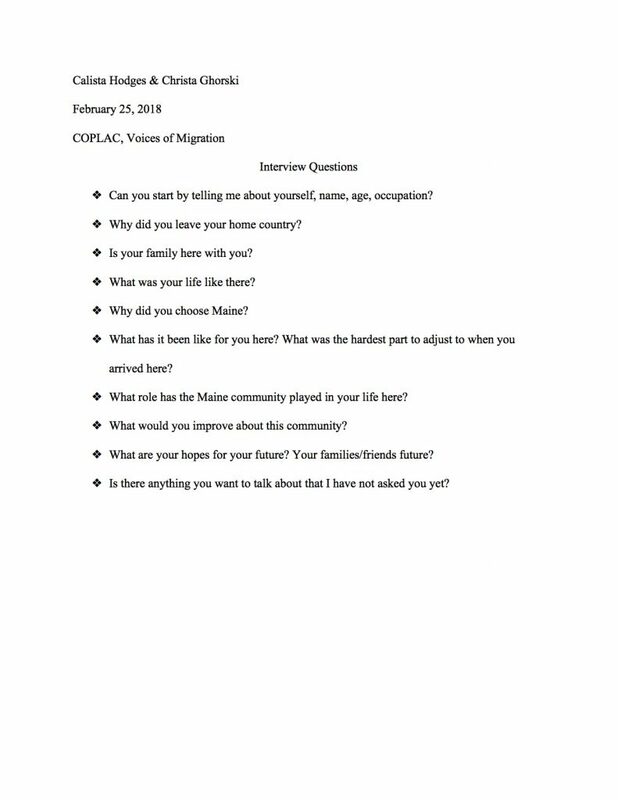 Our first step was researching the migrant populations of Maine which you can read about in my last update. Now, Christa and I have started to draft questions that we will pose during our interviews. You can read more about what Christa and I have been doing on her blog. The document is also available in Somali and Arabic. Cali and I have finally decided to try to reach out to the Somali population that is concentrated in the Lewiston/Auburn area in Maine. The planning is starting in earnest now so things are beginning to roll into motion. We have begun a draft document of our interview questions. It is really important to both of us that we allow the interviewees to be able to share what they think is important, and so our questions are rather broad and open ended. This should allow for us to follow up when interesting ideas and stories surface so each interview we do is completely unique. To learn more about how Cali is preparing, her blog can be found here.